We service a wide range of commercial laundry accounts from Los Angeles to Orange County & beyond. Call us for details and to schedule a pickup 800-960-1627 or complete the form below. 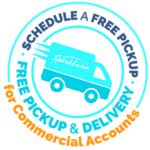 These pickup and delivery services are free of charge and contracts are not required. Our staff speaks both English & Spanish. We are conveniently open 7 days a week from 6:00 AM – 10:30 PM. Please list your preferred date for scheduled pickup. Please note the date is not set until you receive a confirmation call or email from us. Please list your preferred time for scheduled pickup. Please note the time is not set until you receive a confirmation call or email from us.